Drill-less, simple hardware to secure a flush mount tool box to the truck bed. For GMC/Chevy ZDOG flush mount tool boxes only. ZDOG® Truck Tool Boxes specializes in aluminum flush mount tool boxes for all full size crew cab trucks with +/- 5 1/2′ beds. The flush mount tool boxes are patented and handcrafted with industrial grade aluminum that is resistant to corrosion. These hard to find gems are constructed with weather resistant neoprene foam stripping and piano hinges. They are user friendly, usually taking only one hand to open. They are durable and look good. Simply put, they are Forged In Quality®. 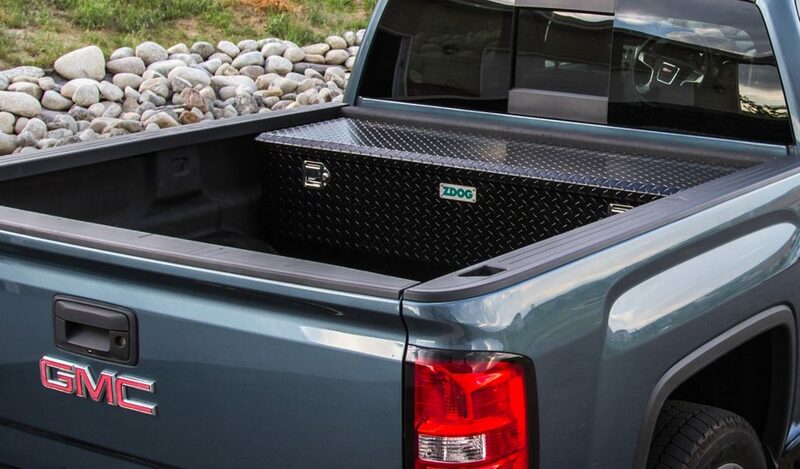 A flush mount ZDOG® Truck Tool Box is made by hand just for your pickup truck. Such as the Chevy Silverado or GMC Sierra 1500 Crew Cab, the Ford F-150 SuperCrew (2015 or newer), the Ram 1500 Crew Cab, the Toyota Tundra CrewMax and the Nissan Titan Crew Cab. You will not find anything like it from another manufacturer! Why install an aluminum flush mount tool box instead of a crossover tool box? Why choose a ZDOG® truck box? ZDOG® flush mount boxes are constructed from high grade .063″ 3003-H22 Diamond Tread Aluminum, known for its durability and beauty. They are outfitted with stainless steel latches and aluminum hinges. They fit like a glove, will last a long time and flat out make your truck look better. While specific truck makes, models and years are mentioned on the site, we highly recommend you measure your truck bed first to be sure a ZDOG® truck tool box will fit. Spray on bedliners are not an issue when sizing your bed for these tool boxes but insert liners can pose a problem in most truck makes and models. And, if you insist on having a crossover tool box, we offer ZDOG® brand crossover tool boxes too! They are tough as nails and built to take a pounding.